The pant features a zippered fly front with snap closure, elastic waist, and belt loops for convenient adjustment. 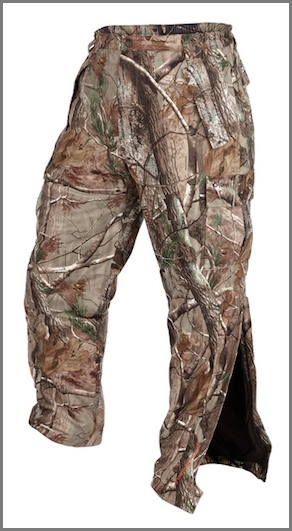 Side entry slash pockets and single back pocket with storm flap gives you ample storage to keep you in the stand or blind for all day hunting. Convenient knee-high leg zippers with snapped storm flap covering and hook and loop adjustment at bottom cuff will protect the wind and rain from entering.